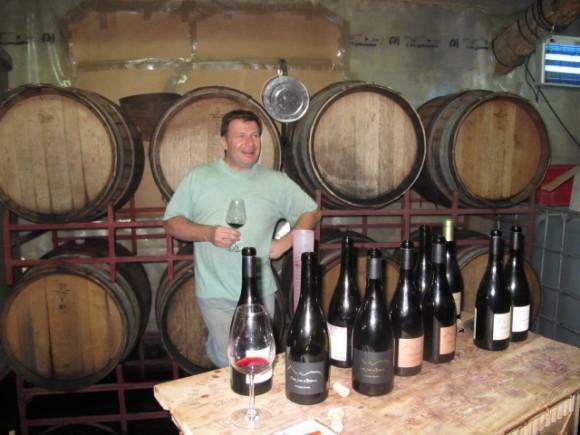 Domaine Saint Jean du Barroux is owned by Philippe Gimel, a master of all things Rhône. He learned his trade at Beaucastel, La Janasse, Pierre Bise and Château Devès. After such a start he was bound to make his mark and with his own vines on the foothills of Mont Ventoux, the highest mountain in Provence that mark has been made emphatically. Philippe Gimel working at Saint Jean du BarrouxFrom day one, Philippe has not pandered to the latest fads or fashions, staying true to his terroir: no wood, no chemicals, no compromise.Philippe's own statement of his guiding philosophy is as elegant as it is possible to articulate: "Tous les jours, la vigne et le vin nous étonnent et nous font découvrir quelque chose de nouveau." With this philosophy and with just 15 hectares of vines (37 acres) in upwards of 70 micro-plots planted with seven varieties of grape, Philippe makes sublime wine.